Josh Hoyer and Soul Colossal have their very own brand of organic soul, that reaches into eras passed and borrows from genres of all sorts. The six-piece band brags of members from every corner of the music spectrum, from Gospel to Pop, from RandB to Rock. So when journalists and publicists boil the band’s sound down to one comparison to any legend of the soul-funk genre, front man Josh Hoyer gets a little irked. Not because artists like Curtis Redding and Otis Mayfield aren’t something Hoyer has ever aspired to in terms of sound, but because he recognizes that these artists are in no way touchable; they come from a completely different culture, era, and upbringing. “I’m just a white boy from Nebraska.” Hoyer half-jokingly laughed to me over the phone. Hoyer was born and raised in Lincoln, practicing jazz choir and saxophone during the day and sneaking behind Lincoln’s destination blues club, Zoo Bar, to peer through the vents, and catch a high off the music by night. But there is some substance to the comparison, even if it is a lazy attempt to describe to the prospective listener that Hoyer seems to sing from a place in the body long ago disconnected, it seems, from the mouths of many singers filling this genre today: the heart. There is something incredibly genuine about the delivery of Hoyer’s gut wrenching bellowing on singles like “Parts of a Man” and “Soul Mechanic” that will have you setting down your Sam Cooke record for a while, and picking up Josh Hoyer and Soul Colossal’s Running From Love. Produced by Ken Coomer (Wilco, Uncle Tupelo) in Nashville Tennessee, Josh Hoyer and Soul Colossal’s third album is the most organic to date. On the difference between this record, Running From Love and the previous two (a self-titled debut In 2014, and Living by the Minute in 2015), Hoyer notes their collective eclectic music experience and a change in the writing process. Unlike the previous two records, in which Hoyer would map out guitar parts on the keys and hand band members CDs to commit to memory, this time, parts unfolded organically. And invested, they are. 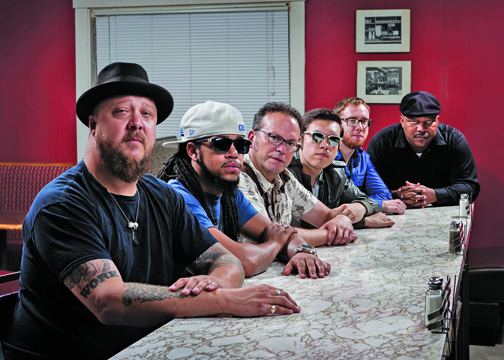 Since 2014, Josh Hoyer and Soul Colossal have released three studio and one live albums, and have played hundreds of shows. Hoyer has a wife and two little girls at home, and he said the connection with the songs, his band, and of course, the audience keeps him going on long tours in which the group is playing six or seven shows a week. LIVE SHOW: See Josh Hoyer and Soul Colossal leave it all on the stage at The Green Frog on July 2, where he says he looks forward to a Green Frog grilled cheese. Tickets are $8. See www.joshhoyer.com.